I received my MFA at Washington University in Saint Louis and my Ph.D. in English, with Creative-Writing dissertation, at University of Tennessee where I am a post-doctoral lecturer. I study poetics and the Victorian Novel with an emphasis on place, the environment, and labor. My articles have appeared in Dickens Studies Annual and George Eliot-George Henry Lewes Studies. My fiction and poetry explore the rural landscape and labor, subjects I see as underrepresented in contemporary writing. My current novel project, Present Blusters, explores the hidden past of the Hudson Valley through the story of a woman who, after getting Lyme disease, sees ghosts on the rundown estate where she lives. 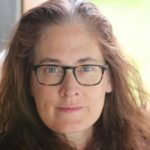 One chapter is forthcoming in Witness, while another has appeared in cream city review as the winner of the A. David Schwartz Fiction Prize. Ph.D. in English with Creative-Writing Dissertation (Fiction), University of Tennessee, Knoxville. MFA in Creative Writing (Fiction), Washington University in Saint Louis. B.A. in English with General Honors, Vassar College. “Elliptical Tick.” Witness Magazine, forthcoming. “Lettie from the Ocean.” Drunken Boat, issue 22, 2015. “They Won’t Take Your Ideas.” Drunken Boat, issue 18, 2013. “The Half-Glass Bed.” cream city review, A. David Schwartz Fiction Prize, vol. 36, no. 1, 2012, pp. 177–191. “Present Blusters.” Konundrum Engine Literary Review, February 2009. “A Hasty Conversion.” Crossing Rivers into Twilight, February 2009. “The River Beautiful.” Konundrum Engine Literary Review, Fall 2006. “Bad Trip.” Memorious, Spring 2005. “The Movie Star.” DIAGRAM, issue 2, no. 5, Fall 2002. “Get In,” “Come On, Landscape!” and “Analogous.” DIAGRAM, forthcoming. “Communications for Health-Care Worker.” Fourteen Hills, forthcoming. “Roller-skating in a Redlined Neighborhood.” descant, Fall/Winter 2018. “Went to Tennessee.” Permafrost Magazine, issue 40, no. 2, Summer Online 2018. “Lyme Disease.” Sonora Review, vol. 71, Fall/Winter 2016, p. 27. “Georgia on Forty-Fourth” and “Undertow.” DIAGRAM, issue 16, no. 14, August 2016. “Day Off.” Judged by Marilyn Hacker, et al. The Hippocrates Prize: The Winning and Commended Poems. The Hippocrates Press, 2012. p. 78. “Key.” DIAGRAM, issue 6, no. 5, Fall 2006. “Record” and “Employee of the Months.” Can We Have Our Ball Back? Summer 2004. “A Lapse.” 42opus, Summer 2003. “Mandatory Audiotape.” Square Lake, Fall 2002, pp. 46-7. “Key.” DIAGRAM III. Edited by Ander Monson, Del Sol Press, 2008, p. 243. “The Movie Star.” DIAGRAM: An Anthology of Text, Art and Schematic. Edited by Ander Monson, Del Sol Press, 2003, p. 215.
Review of Peter Capuano’s Changing Hands: Industry, Evolution, and the Reconfiguration of the Victorian Body. Victoriographies, vol. 7, no. 2, 2017, pp. 180-3.
Review of Anna Henchman’s The Starry Sky Within: Astronomy and the Reach of the Mind in Victorian Literature, George Eliot-George Henry Lewes Studies, vol. 67, no. 1, 2015, pp. 76–80. Review of Hilda Hilst’s With My Dog-Eyes, Rain Taxi, vol. 20, no. 1, Spring 2015, p. 25.
Review of Juliet Patterson and Rachel Moritz’s Elementary Rituals/Dirge, DIAGRAM, issue 14, no. 1, 2013.
Review of Kate Bernheimer’s The Complete Tales of Lucy Gold, Rain Taxi, Online Edition, Summer 2012.
Review of Amy King’s Kiss Me with the Mouth of Your Country, Tarpaulin Sky, Spring 2008.
Review of Mark Nowak’s ¡Workers of the Word, Unite and Fight!, Tarpaulin Sky, Fall 2006.